Long-term YAFB readers might just sense a theme in some of the photos here, but I'm not saying :-). In any case, this one celebrates a really enjoyable VFR Bay Tour done a day or two ago with a friend of mine — Atanu, one of the few people I've known in Sydney, London, and here — and G., his teenage niece who currently lives in Cairo, mostly to show G. the local sights (the Golden Gate, San Francisco, the Bay, Alcatraz, Napa, the Bay Bridge, Berkeley, the Hills, Mt Diablo, etc.) from the air. A perfect day for it, marred only by being stuck in traffic for an hour on a mile-long stretch of Interstate 880 on the way to the airport due to a combination of construction activity and a bad accident on the other side of the freeway. But we got there, and the ensuing flight was deeply enjoyable for all three of us, with G. getting her first taste of flying in a small plane — including probably 30 minutes of actually controlling the thing (under my hawk-like supervision). 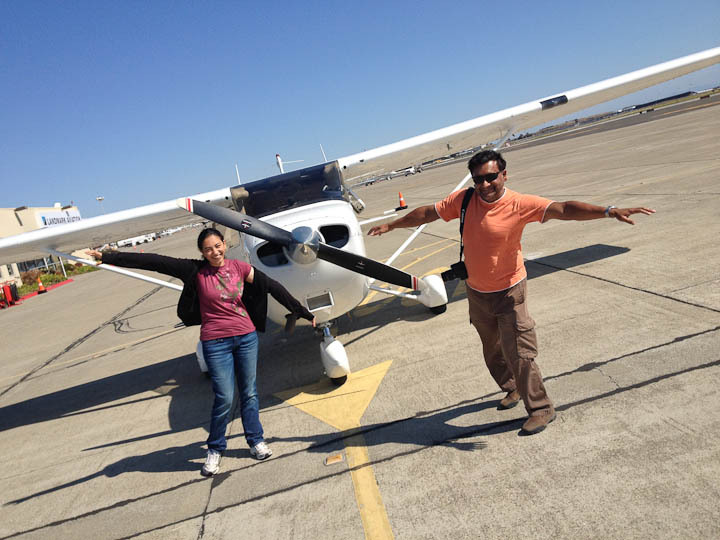 A classic California Flying day, in every way….